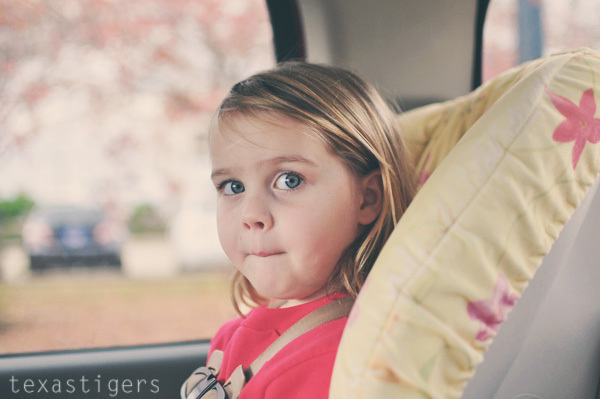 "Let's go to the zoo instead"
My parents have been in town and my mom and I are in major Christmas shopping mode so I thought I'd start passing along a few of my favorite ideas. Mostly for the kids though because if I posted ideas for the adults I'm shopping for then they might just figure out what they are getting and it would no longer be a surprise. A Zoobie is a favorite of mine. These are pillows with blankets inside so it makes an animal to play with, a pillow or you can take the blanket out to cover up with. 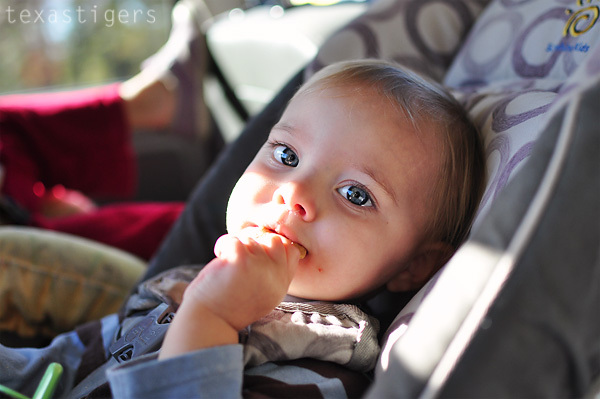 Because of this they make for fabulous travel toys with a blanket, pillow and toy all in one! There are many animals to pick from too! Even a book based collection with the hungry caterpillar and Oliva! How cute is this little lion? Or this Koala with it's baby? I've also posted another great Christmas idea from Shutterfly over here if you want to check it out! 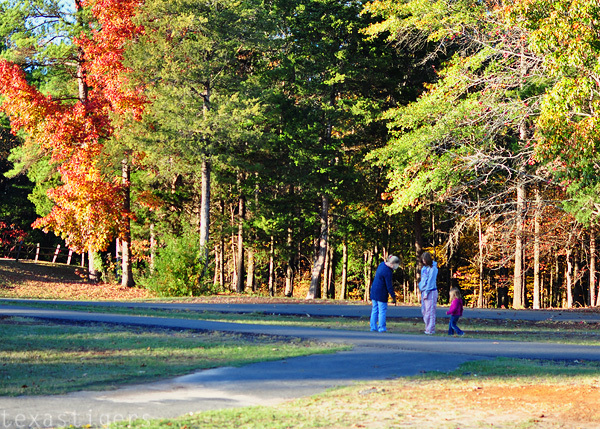 Then Grandma and Auntie Scarlett went to walk around the path around the park. Abby decided she wanted to go to. Then Micah felt left out so he ran as fast as his little legs would take him to catch up. So we all went on a walk. 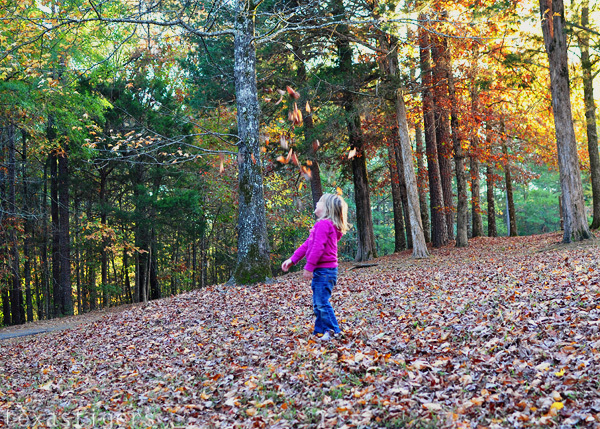 Abby loved the leaves most of all. After the walk Micah just wasn't having it anymore. It seems he got a little chilly and was ready to warm up. I don't blame him it was chilly out. His little nose and fingers got pink. If it was cold often down here I might look into tiny mittens. I wonder if he would keep them on? Saturday we got up early (well except Micah who again proved my theory that the days we have to get up early and on the move he'll sleep in - like the Thursdays I want to try to spin class at the gym that he would normally be awake for but sleeps in instead), ate some breakfast and hit the road. We made it about 15 minutes before Abby declared she had to potty and maybe 20 before we had the first meltdown over who had which stuffed dog. Then 15 minutes after that meltdown #2 because we switched downs and switched which dog we wanted. I'm sure everyone was thinking this was gonna be a very long drive home! Luckily after a potty break an hour down the road we seemed to be doing better. And made hats out of books to be silly. Of course if Abby does it, Micah has to copy. 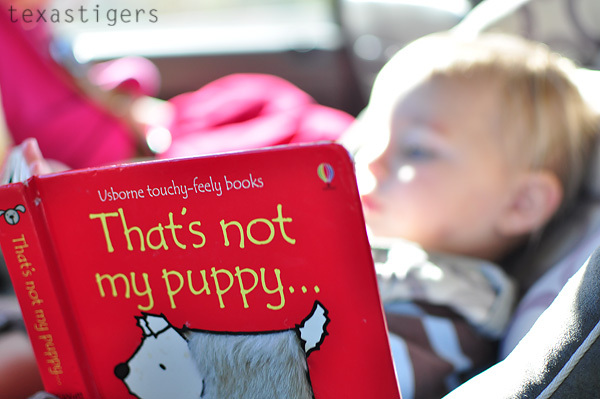 Books alone don't keep the kids content.... we had several snacks to keep the kids happy and forget they were strapped into the car for a couple hours at a time. We made it home in the early evening only to watch LSU lose to Arkansas. I shouldn't have turned on the tv - we seemed to be doing better while I checked the score on the gamecast on my phone (well until it died) The kids were happy to be home and out of carseats and ran around the house to run out some energy as it was getting dark so we couldn't play outside long. We are spending time up at Aunt Scarletts' and Uncle Nicks' for Thanksgiving along with Grandma and Grandpa. It's great to be able to spend time with family. We headed up here Tuesday afternoon and made it to our destination late Tuesday night. The little ones did really well on the long trip and we only had one rough patch around bedtime. Our course what is one of the first things that must be done in a hotel? Playing on the bed right? This didn't happen until the morning though since we arrived at the hotel late at night with two sleeping kiddos. 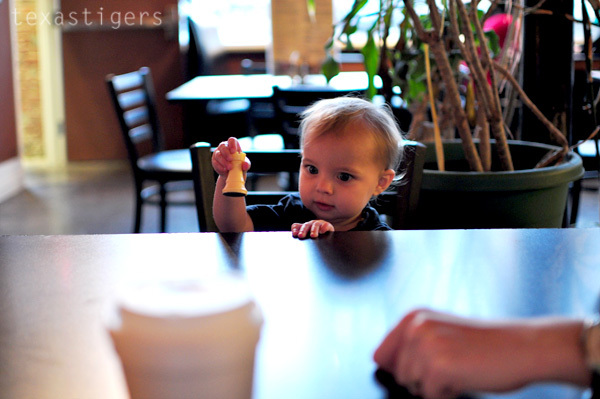 One of the things Beau wanted to do during his visit was a trip to the Frothy Monkey - a local coffee house. Unfortunately they were actually out of the frothy monkey drink (well out of the banana flavoring to make it) but I enjoyed a delicious Chai Latte. Mmmm.... wishing I had another one of those right now. 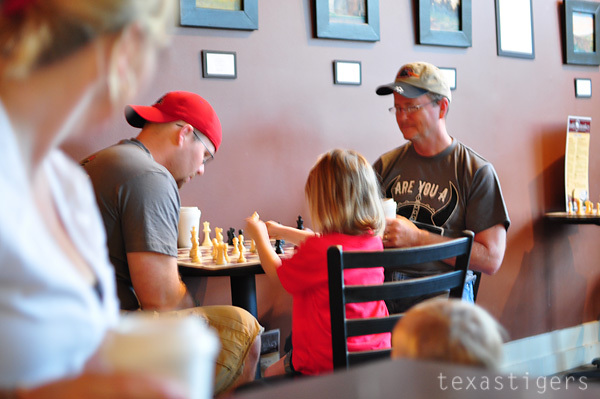 The men played some chess while we drank our coffees, teas and hot chocolates. Micah took off with a chess piece or two while we were there. 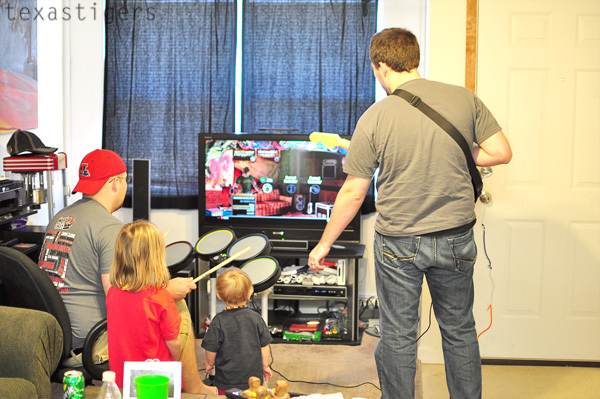 We also got our introduction to the game of Rock Band. Both kids (and Beau) loved it. I think it might be going on Beau's Christmas list - either that or Guitar Hero. Now Beau has headed back home as he has a work shift (but we'll miss him and wish he could have had more days off) and the kids and I will ride home with Grandma and Grandpa tomorrow. Waiting for us when we get back will be Gigi and Pops. It's always wonderful to spend time with family and we've had a wonderful time here! We are just so thankful for our wonderful families! I hope everyone has had a wonderful Thanksgiving today! We celebrated with family and enjoyed a delicious meal together. 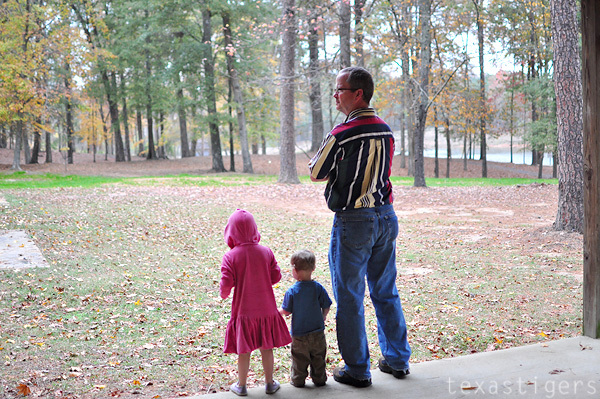 Before we ate though Grandpa and I took the little ones out to a park to see all the leaves. Leaves and the beautiful shades of the trees are not something we see often down in South Texas. It's quite a change. Though the weather today (at least up until this evening) was pretty similar. It was actually about 75 degrees and really muggy today. It rained on us at the park and really started raining more this evening as the cold front is coming through. Tomorrow has a high of 51 - quite a change in weather happening overnight here! 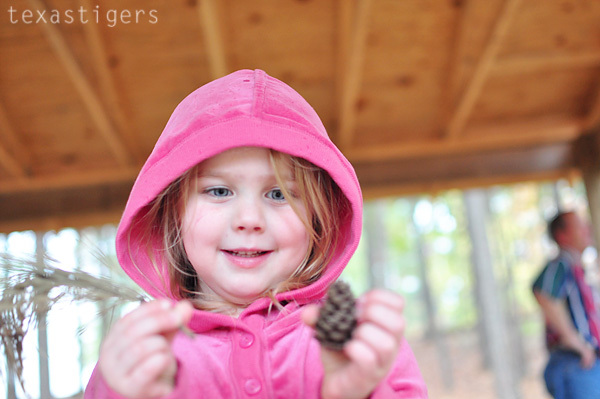 Both kids were really enjoying all the different pine needles (Abby called it a peacock tail) and the pine cones. 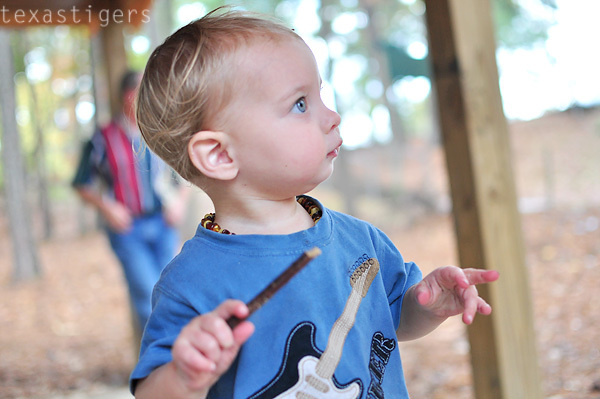 Micah found some sticks to play with. During some of the harder rain when it wasn't just a few drizzles that managed to slip between the trees we played 'house' under one of the pavilions. Abby told us where each of the rooms were and even gave the house a large bathroom. Then the kids ran back and forth to burn off some energy since we knew the rain would likely keep up and there wouldn't be much more playing outside the rest of the day. I am just so thankful for my family and these little ones - as busy as they keep me - they are just sweet little joys to have around. 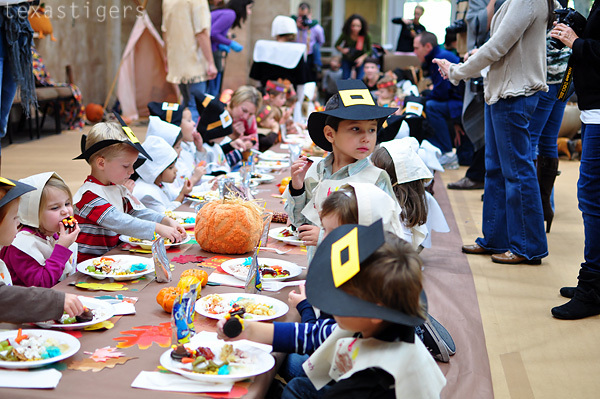 Friday at Abby's preschool they had a Thanksgiving feast for all the kids. 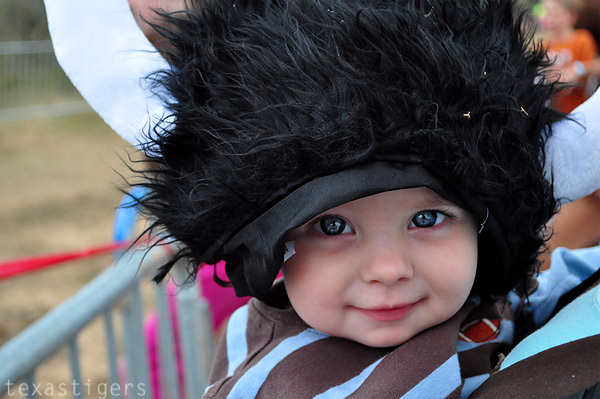 It was adorable to see them all dressed up in Pilgrim attire with hats for the boy and little bonnets for the girls. 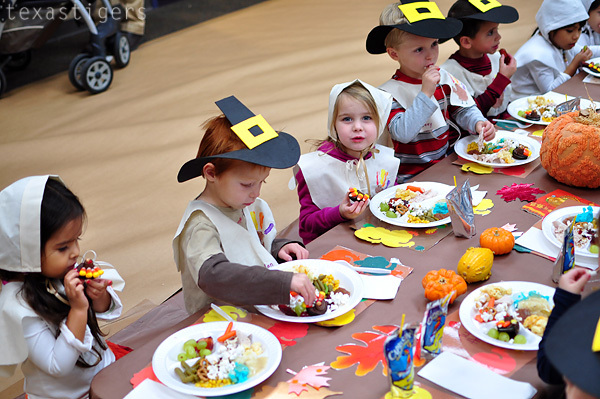 They had a full Thanksgiving meal complete with Turkey, mashed potatoes, corn, jello jigglers and Abby's favorite little turkeys made from Oreos and fall candy corn. Saturday in Bible class they made thankful tree pictures. 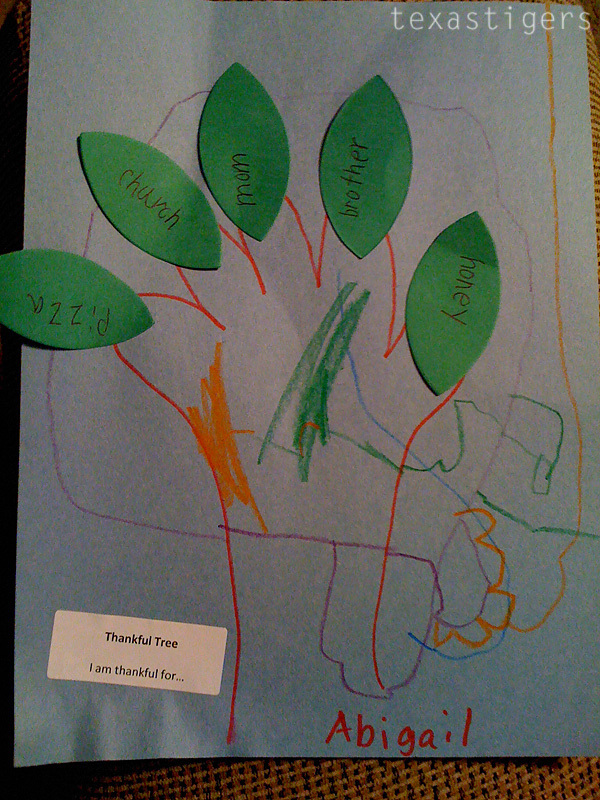 She told her teacher she was thankful for pizza, Church, Mom, brother and Honey. This morning started bright and early (well I guess technically it was almost sleeping in for Beau compared to his wake up time some days of the week!) 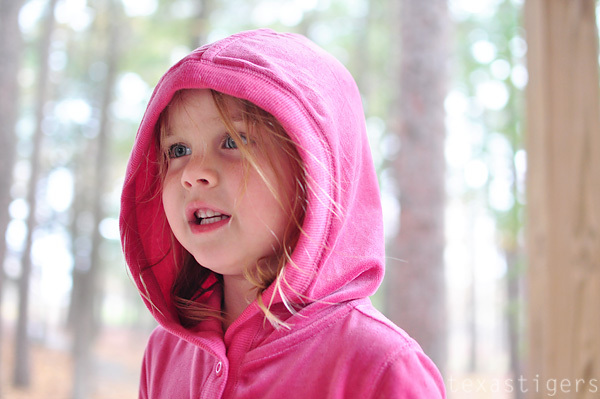 We got ready, packed a change of clothes and towels for Beau, found some old tennis shoes and we were off. The whole way to our destination a little outside of Austin, Beau and his dad talked smack to each other (in a loving father son way) - I was driving so he could text. Grandma said she couldn't relay one of Beau's texts to Grandpa without catching her breath she was laughing so hard. The text? "If a son trips a father in the woods would anyone know?" We finally got to our destination. Everyone got a chance to try on the helmets because the boys weren't going to run with them! The boys lined up for their wave and then they were off! Off to do what you ask? Well a 3.2 mile run - broken up with some obstacles. 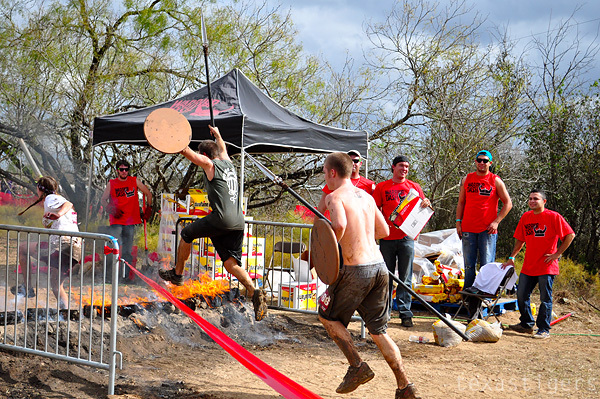 These obstacles included: jumping onto/off of old cars, climbing over walls, hay bales, walking a plank, running through a river, rappelling down a wall, crawling over a net, running through tangled ropes then through a forest and finishing with a cargo climb, jumping over fire and crawling under barb wire in a mud pit. 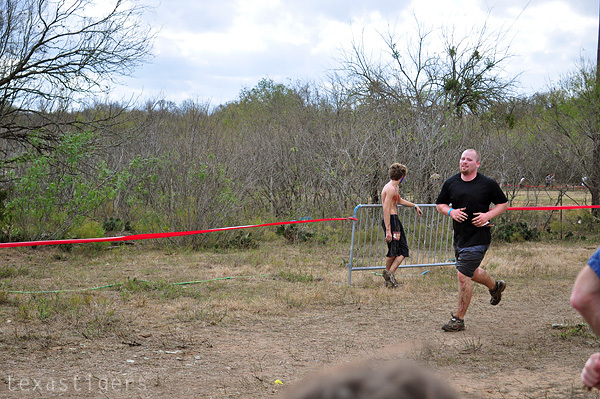 We moved across the way and watched as runners from the previous waves came through the final three obstacles. These included the rope climb, a jump over some fire and a mud pit to crawl through (which sadly I didn't get any pictures of!) These guys who were in charge of keeping the fire going were hilarious and quite the entertainment as we waited for our guys to run through. With the race entry came a free beer so they would be encouraging yelling for the runners to come on and get their free beer at the end, they were almost there. Our favorite though was when they started telling people the fire wasn't real it was just an computer generated imaged.... but it was still hot. 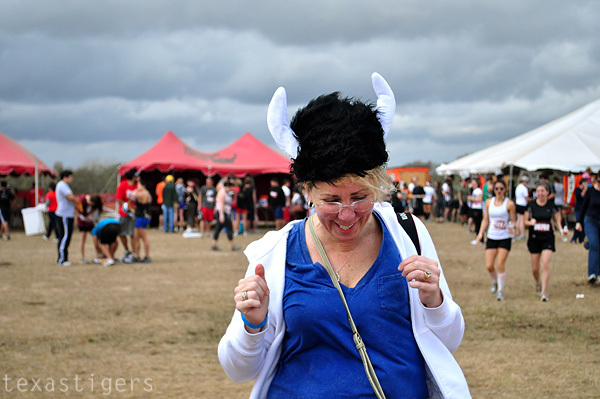 Of course what's a race like this without a costume contest? 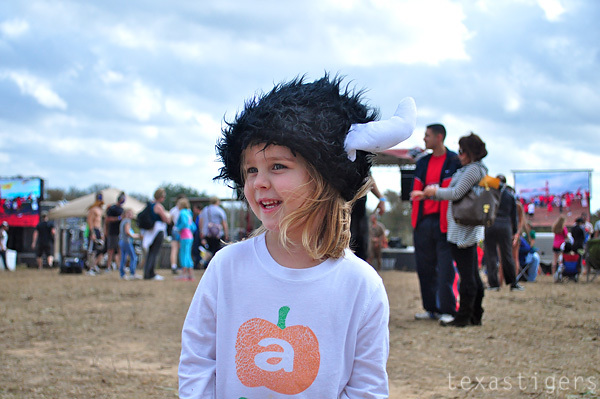 We saw a pair dressed as a gorilla (just the face mask with all black clothing) and his race partner was a banana, Tarzan, and lots of warriors - though not many of them ran the whole race with spears. Finally we saw Beau coming through. I could have used a longer zoom here! (Or moved closer but then I would have missed the fire jumping!) 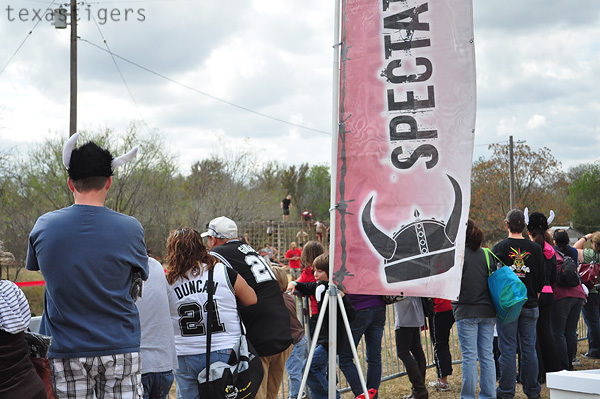 Beau is the little figure wearing a black shirt on top of the rope climb wall. Here he comes! 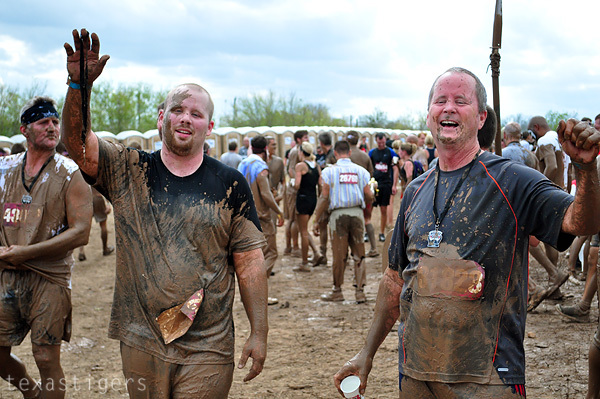 After this picture he jumped the fire and then dove into the mud pit to crawl under the ropes. What a way to end a race! And the final after picture. Great race guys! Of course this may not quite be the craziest thing they've ever done after January. 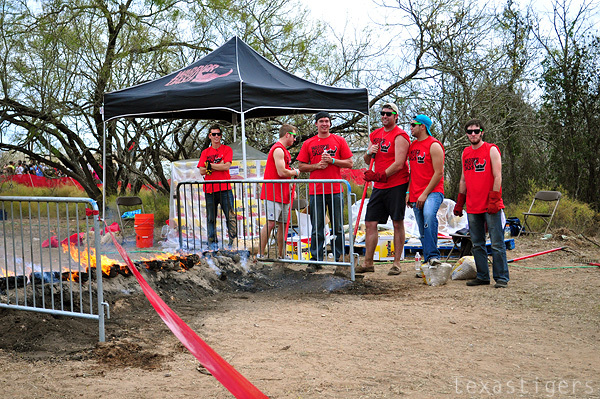 Well it's not the craziest thing for Beau anyway as he'd rank his bull riding above the warrior dash. 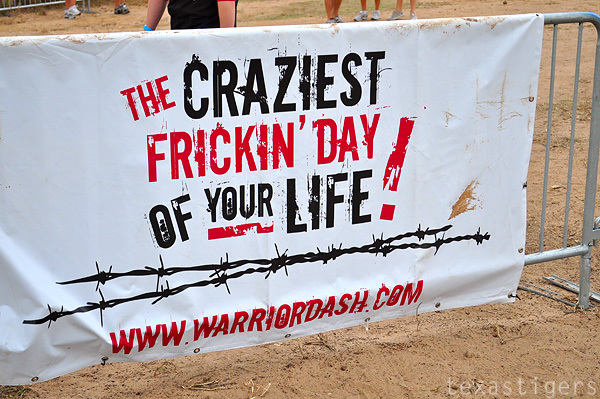 Beau found out about this through me seeing the warrior dash mentioned on another blog. Well I was looking at the Warrior Dash FB page today and saw an ad for another race similar. 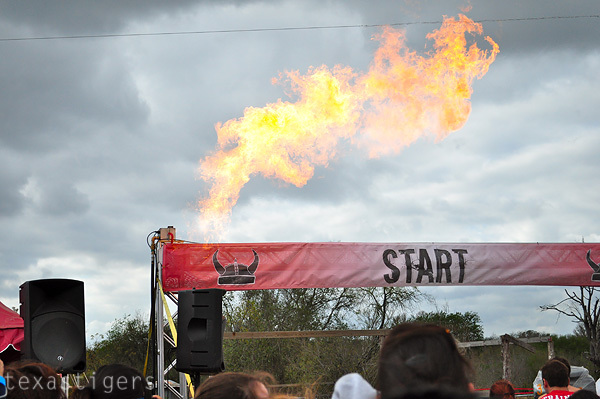 Only that one is 9 miles - not 3.2 like the Warrior Dash. That one might be a little crazier. Even crazier is that the boys are now thinking about running it! Much of today was spent doing some cleaning and chores. Or at least attempting with two little ones around. Micah is proving to be quite the little trouble maker. While I was doing breakfast dishes this morning, he was in the pantry up to no good. He found the packages of dried split peas and black beans (from this craft) and had a little too much fun spilling them playing with them on the floor. Then while I was folding laundry - Abby piled some blankets and pillow into a laundry basket and pushed Micah around the kitchen and living room in the basket. He got such a kick out of that. (Plus it meant I was actually able to fold the laundry instead of Micah 'helping' by unfolding/spilling all my folded piles!) Then when I needed that larger basket back to put the folded laundry into, Abby took over the small basket and made Micah a bed to sleep in. 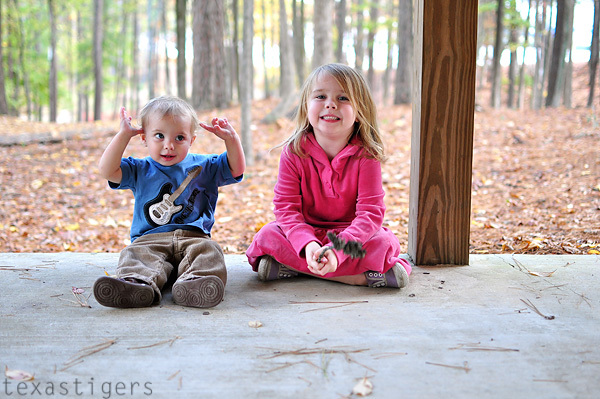 He cooperated with her too and played along. Then this evening nearly Abby nor Micah were quite ready for bed so I postponed bedtime by about 30 minutes. Abby really wanted Micah to play with her so they ran off to her room and when they came back in about 5 minutes they were both dressed in Abby's dress up clothes. Micah let Abby dress him up in the feather boa. They ran off again (because "they had a show to be in" according to Abby) and came back with a costume change. Micah now had on one of Abby's old navy tanks (in pink no less) and wanted help putting on her pink cowboy boot slippers. One of these days Micah might not be too happy about the things Abby dressed him up in but boy was he amused this evening with playing dress up with sister! We headed out to play yesterday evening, like we do many evenings while dinner is cooking. Abby was such a sweet helpful big sister. 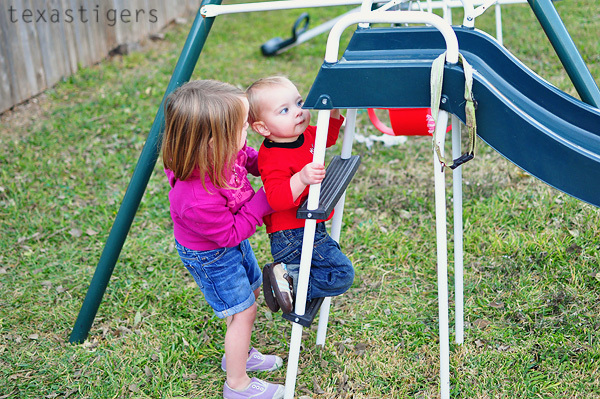 She gladly stood by the ladder to the slide and helped Micah climb up many many times. 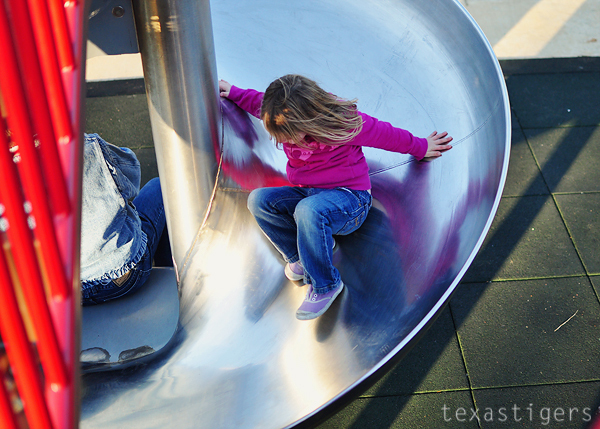 Micah would slide and run back over and over and over and Abby would just stay there and talk with me about how she was being such a sweet sister and that she didn't want a turn she just wanted to help brother. 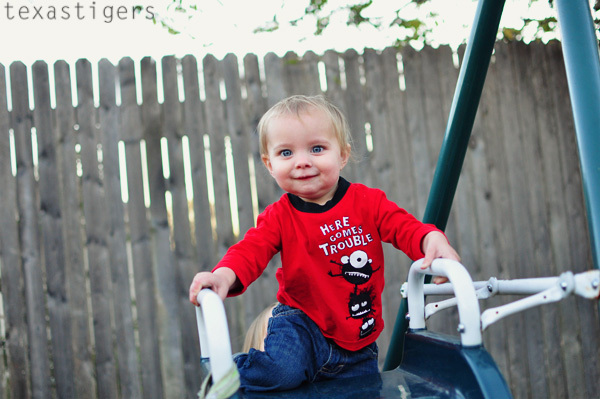 Micah had so much fun on the slide. He was mighty pleased with himself that he was climbing up the ladder like a big boy. 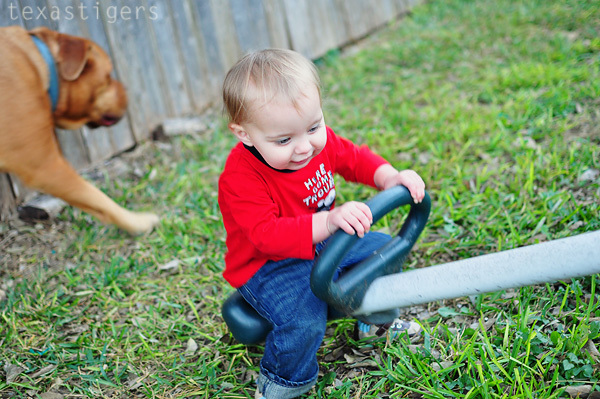 Then it was off to the see-saw where he so wanted to make it teeter all by himself. He tried standing up with his feet on the ground to try and pull the seat up. Abby wanted me to take a 'pretty picture' of Honey for her to see. 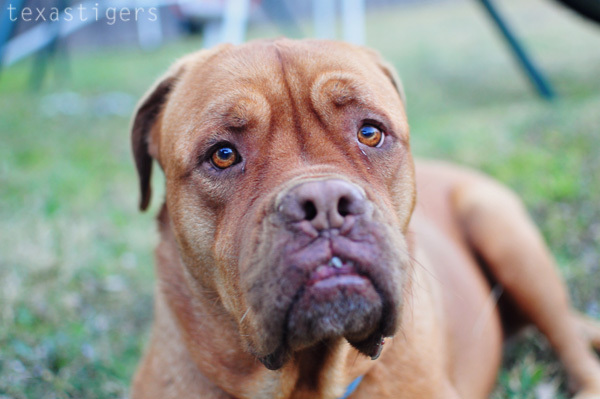 Sorry darling - I tried but I'm not sure a 'pretty' picture can be taken of Honey. She's not a bad looking dog but she isn't the most adorable photogenic dog either. 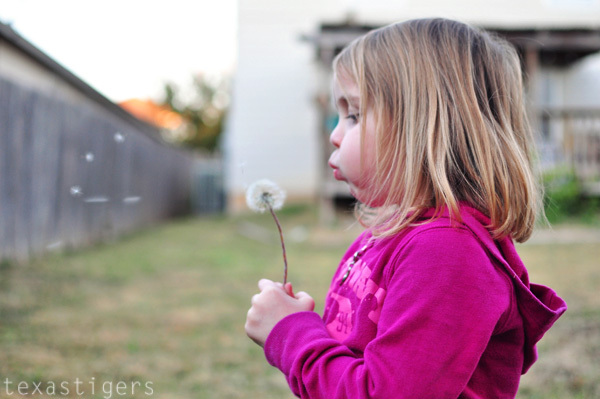 Abby loves blowing these. Yes blowing them just makes more weeds but oh well. Micah sat down and got one and tried to blow it just like big sister - too bad my camera battery died right before that. Happy Friday! Anyone have fun plans? 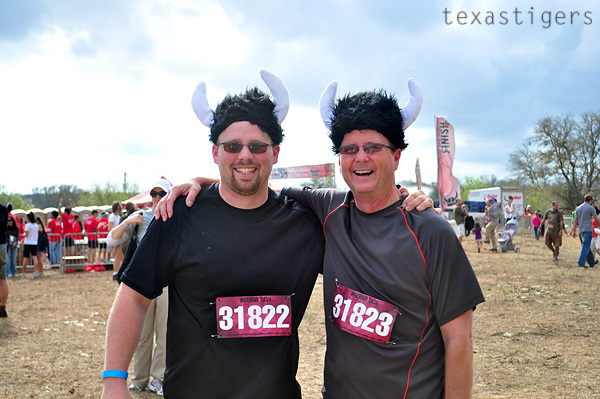 Beau and Grandpa are running the Warrior Dash this weekend as well. Should be a fun weekend.